Another year is over, and the next one is set to be even better! 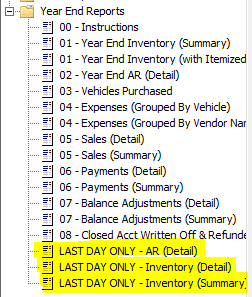 It's easy to forget with New Years celebrations and joyful outlooks distracting, but important to print your Year End inventory and Account Receivables (for buy here pay here dealers)! It will probably be the first thing your accounts asks you for in a few short months at tax time, so it's good to have the most accurate information possible! Luckily, Dealer Solutions provides a Year End Report pack to make the process very easy. Starting 2017, the files are installed to the "Year End Reports" folder WITHOUT a year. These reports will be used every year from now on and may be used to print prior years and year-to-date reports as well. Only the present-status reports (i.e. the ones that show a current snapshot rather than a history log) must be printed at a certain time. These are: one of the Current Inventory reports and an AR Detail report if you are a buy here, pay here dealer. The rest may be printed at any time if your accountant requests them, or you may print every report now and just keep them on file. In the Year End Reports pack, you will only need to print the ones labelled LAST DAY ONLY, and only one of the two inventory reports must be printed (your choice). If you forgot to do this, or lose the reports between now and tax time, we have alternatives that can try to reconstruct the data, but these are less reliable by nature and subject to input errors, so we highly recommend using the present status reports printed on time when possible. These reports should be printed AFTER the end of business on 12/31, and before you change anything in the new year. This means no sales, no taking payments, no stocking-in vehicles, NOTHING until your print these reports. When you do it is up to you, but it may be easier at the start of business day in the new year. This way you have more time to make any changes, if necessary, before printing a final report. First, install the Report Pack using the link at the top of the page. Then, open the Reports Center and click the plus sign next to the Year End Reports folder. The present status reports are labelled LAST DAY ONLY. The are labelled as such because they will be inaccurate if you print them any time except after the last day of business, and before making any new entries in your DMS. Reports #01 and #02 are the replacements that may be printed at any time, but may be less accurate due to potential input errors. After you have printed these reports, YOU MUST NOT BACKDATE ANYTHING! If you enter a new payment and backdate it to the previous year, you have just invalidated your reports. If you enter a new vehicle and make the purchase date in the prior year, you have just invalidated your reports. The same principal applies for expenses, adding or deleting sales, closing accounts and backdating the closing date, etc. Take care of anything you have on hand that needs to be applied to the prior year before you print these. If you have a need to backdate or change something further into the year, just throw out these present status reports and use one of the reconstruction reports in their place (numbers 01 and 02). If you do Year End markdowns DO NOT CHANGE THE VEHICLE PURCHASE AMOUNT. In this case, you would add a negative expense to bring the cost down to zero (or whatever number you need) and date it 1/1 or later. Be mindful of the pack as you may want to zero it out first before doing the markdown.